Gotham/Principal, producers of this Friday’s Maze Runner: The Scorch Trials, has partnered with WGA award-winners Bryce Zabel and Jackie Zabel and their Stellar Productions to produce Captured, based on the rights to the first reported alien abduction that took place 54 years ago this week. 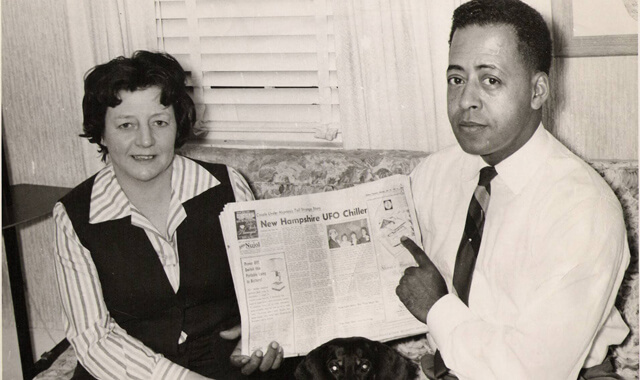 Captured tells the story of Betty and Barney Hill, an interracial couple from Portsmouth, New Hampshire who said they were captured by a UFO the night of September 19, 1961. A black postal clerk and a white social worker, the Hills claimed that, during the alien abduction, they had been studied by extraterrestrial creature, and then returned to their lives with missing memories that were later retrieved under hypnosis. The script, to be written by veteran writer/producer Bryce Zabel, will be based on the 2007 non-fiction book “Captured! The Betty and Barney Hill UFO Experience: The True Story of the World’s First Documented Alien Abduction” by nuclear physicist Stanton Friedman and Betty Hill’s niece, Kathleen Marden. That book contains new information and personal details about the case, and the movie will place the events in a context of both Cold War paranoia and the country’s struggle over race relations. A former CNN correspondent, screenwriter Bryce Zabel, is among Hollywood’s leading experts on UFOs. Zabel wrote Syfy’s first original film Official Denial, worked on the development team forSteven Spielberg’s Taken, and has recently co-authored the non-fiction A.D. After Disclosure. A former CEO/Chairman of the Television Academy, Zabel is also an adjunct professor at the USC School of Cinematic Arts where he teaches two advanced courses about writing hour TV dramas. The Betty and Barney Hill alien abduction case was previously adapted for the small screen as a 1975 telefilm, The UFO Incident, which stars James Earl Jones in the Barney Hill role.